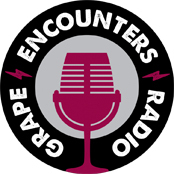 Grape Encounters Radio is your weekly connection to the People, Places and Products that make wine so much fun! It is not a program for wine snobs. It is a show is designed to help you discover the ambiance and the passion that brings great wines to life. They focus on wine and the things that compliment it. Grape Encounters takes listeners to the heart of the experience and lets them be a part of it.